During the spring of 2014, my husband and I took our first trip to Hawaii together. During that trip, we heard of poke for the first time. On the Big Island, there was a restaurant, really a little storefront, located within the confines of a small hotel in Kailua-Kona that specialized in serving all different types of poke and was consistently ranked as the #1 restaurant on the island. While we never had a chance to try out this restaurant ourselves, we certainly noticed that poke was on the menu of so many different restaurants we did dine at. So of course, during that same trip, we got our first taste of poke and we both fell in love. Fast forward a year, we started to notice that poke had made its way from Hawaii as an island specialty all the way to the Mainland. Poke started showing up on more and more restaurant menus in Southern California, especially restaurants along the coastline. Then, poke shops starting popping up all over the place and the poke craze had really hit all over Southern California. Locally in our neighborhood near Westwood, a very popular poke shop arrived on to the scene and my husband and I decided to head over to try it out for ourselves. Poke Me is a small storefront located on Westwood Blvd. 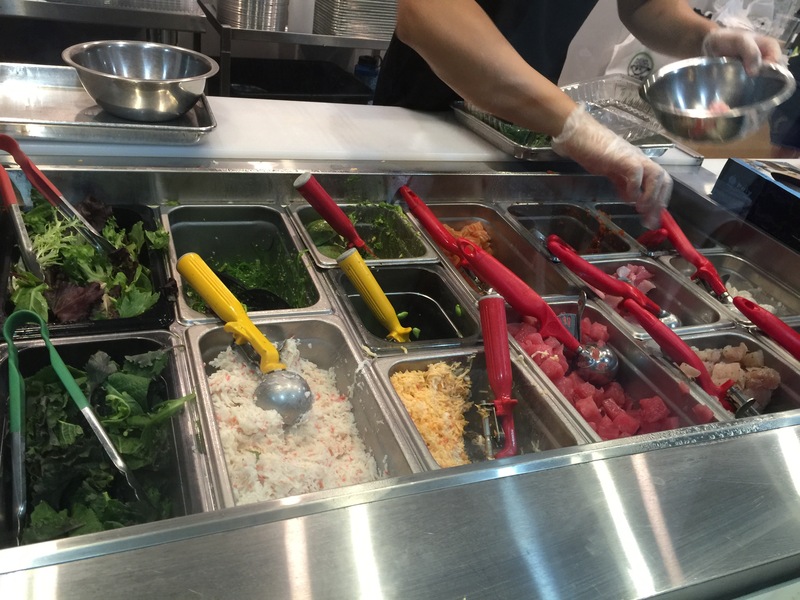 that is set up much like you’d see at Chipotle where guests have the ability to choose the ingredients and sauces that make up their individual poke bowls every step up the way. 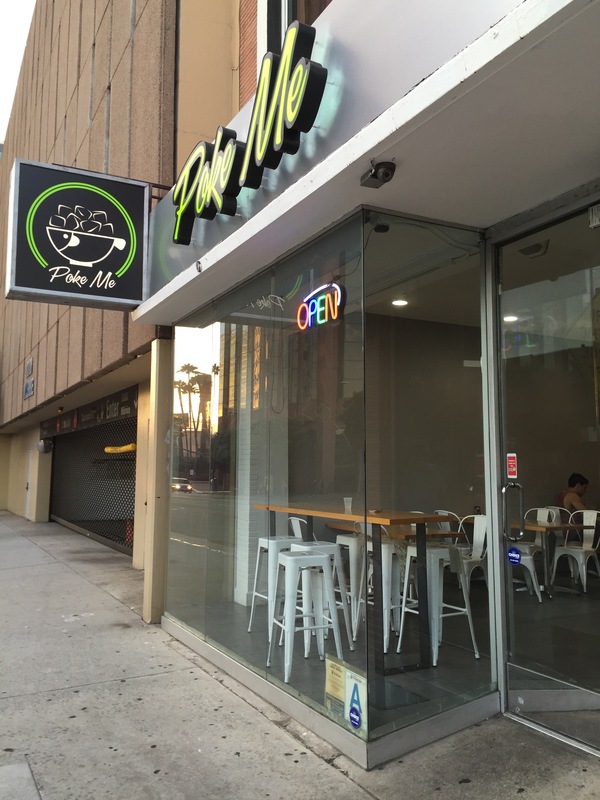 As one of two locations, with a second store being in Los Angeles’ Miracle Mile, Poke Me is quite popular as a quick, delicious and easy grab-and-go lunch and dinner store. 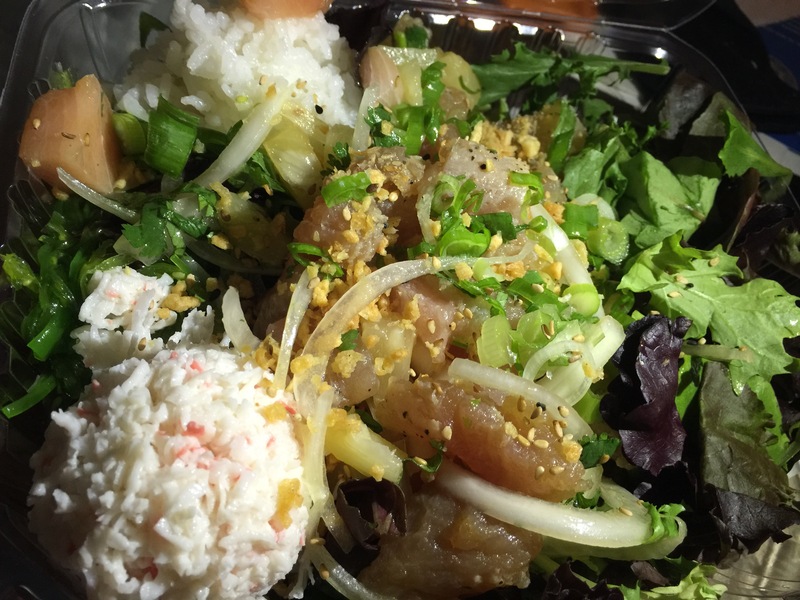 For those who aren’t sure what poke, pronounced “po-kay”, is, it’s quite simply a raw fish salad. Created in Hawaii, it originally started out as an appetizer dish, but can often be found these days in bigger portions and served as an entrée. Quite literally meaning “section” or “to slice or cut” the word poke is actually a Hawaiian verb. As the popularity of poke has grown, more and more tourists visiting the Hawaiian islands have had an opportunity to enjoy poke and have come home to the Mainland singing its praises. Therefore, it’s no surprise that this so-called poke craze has finally reached Southern California as well. 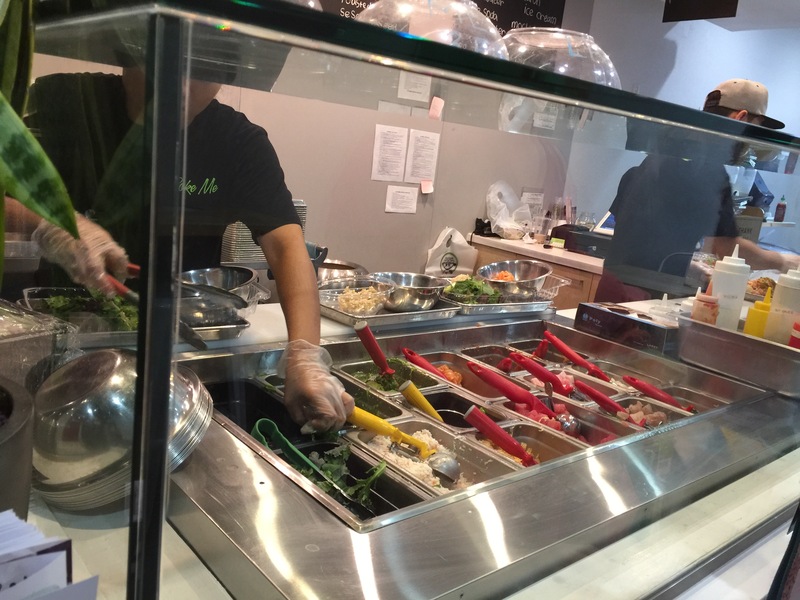 When you walk into Poke Me you’re met by a glass-fronted display case where all of the various raw fish cuts, toppings and sauces are displayed for you to pick and choose from. 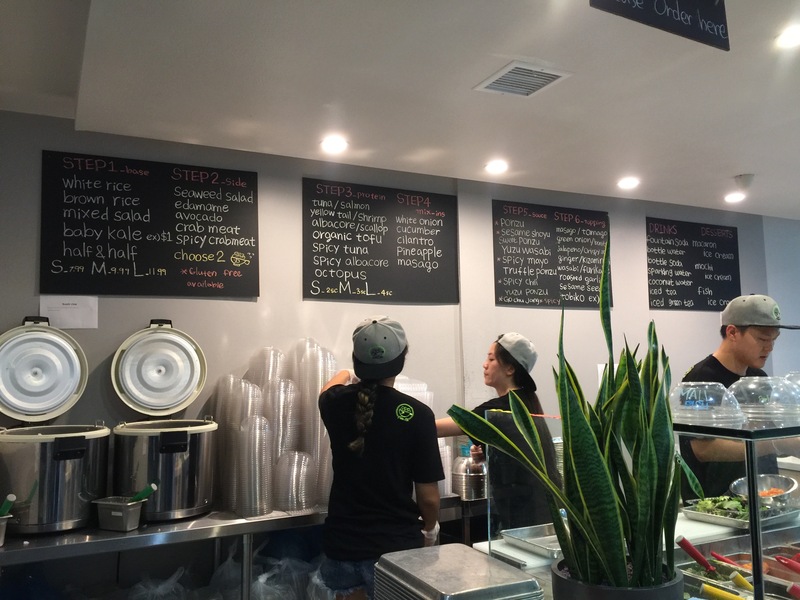 On the wall behind the counter are several chalkboards that walk you through the process of how creating your own customized poke bowl works. Follow the instructions on the board, choose the ingredients laid out before you, and boom, you have your very own individualized poke bowl. The first step in the process is to choose whether or not you want a small, medium or large bowl. And believe me, the sizes are quite generous. The next decisions to make are to choose the base, choose a side, make a choice on protein, select the mix-in, select the sauce and then choose the toppings. After these simple steps, your poke bowl is done and ready to be enjoyed. When my husband and I visited Poke Me, we both decided to choose a medium bowl to start with. The next step is to choose a base. The options are: white rice, brown rice, half & half, mixed salad and organic baby kale. For my bowl, I chose the half and half, with half being steamed white rice and the other half being mixed salad. Surprisingly, my husband actually chose the same base for his poke bowl as well. It seemed the best of both worlds, half a salad and half a rice bowl. After the base, the next decision is on the side. The side options include: seaweed salad, edamame, avocado, crab meat and spicy crab meat. We each get two choices for sides. I chose avocado and crab meat for my sides, my husband chose crab meat and seaweed salad. It’s time to make a choice on protein. For a small bowl, you get 2 scoops of the protein of your choice, for a medium bowl it’s 3 scoops and for a large bowl, it’s 4 scoops. For my 3 scoops, I chose 2 scoops of yellowtail and 1 scoop of tuna. My husband took two scoops of albacore and 1 scoop of yellowtail. It’s nice that you can mix and match the protein choices to vary the flavors. The protein options were: tuna, salmon, yellowtail, albacore, shrimp, scallop, octopus, spicy tuna, spicy albacore and tofu. Lots of different options and lots of different flavors. Time to add the mix-ins. Mix-in options include white onion, cucumber, cilantro, pineapple and masago. The mix-ins, sauces and toppings are unlimited, so you can get as much or as little as you want. For my mix-in, I chose white onion, cilantro and cucumber. My husband’s mix-in choices included white onion, cilantro and pineapple. Next up were sauces. For sauce options, we could add sesame shoyu (spicy or mild), ponzu (spicy or mild), sweet ponzu, yuzu ponzu, yuzu wasabi, spicy chili, spicy mayo, truffle ponzu, and gochujang. That’s a wide variety of sauce selections from salty to sweet, to tangy to spicy. For my bowl, I chose the yuzu ponzu sauce. For my husband he chose the sesame shoyu. The last decision to make was to choose toppings for our bowls. The topping choices included: masago, green onion, jalapeño, ginger, crispy onion, bonito flake, corn, wasabi, roasted garlic, tamago, kizami nori, sea salt and tobiko. For my bowl, I chose toppings of bonito, green onion, roasted garlic and sesame seeds. For my husband’s bowl, he chose the toppings of green onion, sesame seeds, and roasted garlic. After everything is put together, a medium poke bowl is actually quite large. Here is my bowl of half steamed white rice, half mixed green salad with a side of crab meat and avocado, topped with yellowtail and tuna mixed with white onion, cilantro and cucumber and yuzu ponzu sauce and finally topped with green ions, roasted garlic, sesame seeds and bonito flakes. The fish for the poke was really tender and fresh and the ability to make a poke bowl using all of the ingredients of your own choices was really appealing. Having a bowl made up of half salad and half white rice was like having the best of both worlds with the salad seemingly a healthier and lighter option than the rice. But, honestly, I actually liked the white rice better. I loved how all of the flavors blended together with the rice and mixed in adding their fresh and bright flavors to the rice. The creamy avocado that I chose as a side was a perfect complement to the rich fish of the poke bowl. The avocado really cuts through the fat and its creamy flavor helps to bring together all of the toppings. The yuzu ponzu sauce was a little tangy and a little sour, which again was a good complement to the rich, fatty fish. And of course, all of the flavors of the entire poke bowl were just perfect, of course, that is because I chose all of the flavors. What I love is that the combinations are limitless. When I first learned about Poke Me and invited my husband to go and check it out, he was a bit more skeptical about how good a local poke shop could be. He’s loved the poke we’ve enjoyed on our various trips to Hawaii, and he was concerned that getting local poke would ruin the experience of the memories of our Hawaiian poke. But again, the idea of being able to make your own concoction with the flavors and ingredients of your choice convinced my husband to give Poke Me a try. My husband’s medium poke bowl consisted of half white rice, half mixed salad with a side seaweed salad and crabmeat . His fish choices were albacore and yellowtail mixed in with white onion, pineapple and cilantro, a sauce of sesame shoyu and topped with green onion, sesame seeds and roasted garlic. After a few bites into his poke bowl, my husband was sold. He enjoyed the freshness and tastiness of the fish. He really thought that the pineapple that he added as a mix in really brought out the vibrant flavors of the fish and brought all of the toppings in and complemented everything really well. It was a little sweet, a little sour and just the right touch for his taste. He was really happy with the sesame shoyu sauce that he chose as it added a bit of nuttiness and sweetness to the poke. He said he could have done without the crabmeat side, but he did like the seaweed salad side. The white onions in the poke bowl added a bit of crunch and bite, and the sesame seeds reinforced the great nutty flavor of the sesame shoyu. My husband was a fan of the make-your-own-poke-bowl idea and immediately suggested that we put this on our list of places we go back to in the future, especially since it’s literally in our own backyard. After our first experience enjoying poke in Hawaii, my husband and I were hooked. When good quality, delicious poke arrived in Southern California, we knew we were in for a treat. 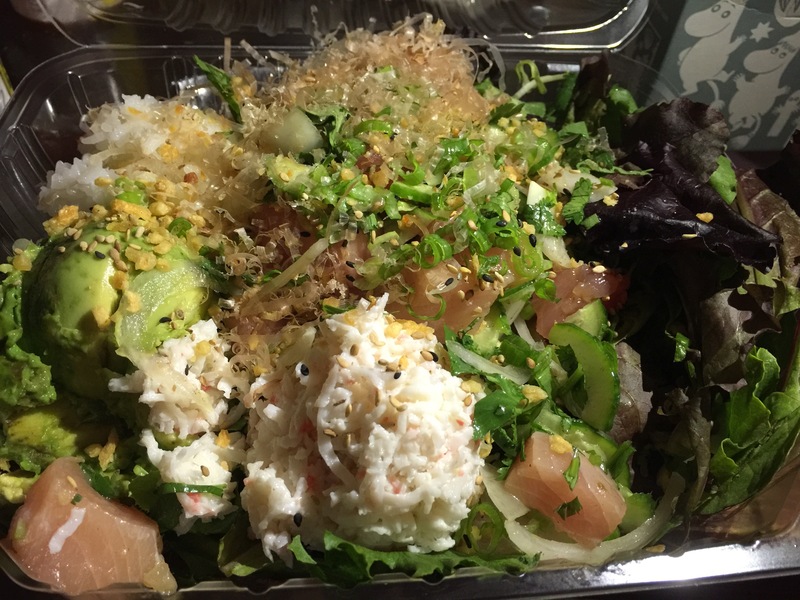 No longer did we have to travel all the way to Hawaii just to get a fresh, and delicious bowl of this raw fish salad. Add to the mix an operation such as Poke Me which essentially allows you to make-your-own-poke-bowl and it’s a win-win. Choose your base, choose a side, choose your protein, mix-ins, sauces and toppings and you have the most amazing poke bowl, all made with flavors and sauces of your own choosing so you control what goes into your poke bowl and you control the flavor. The fish was fresh and delicious and tasted amazing, add in the toppings and the sauces and the flavor profile was just fantastic. While poke in Southern California isn’t quite like having poke in Hawaii, it’s certainly the next best thing without having to take a 5 hour plane ride. This will certainly do for now until I can get back to Hawaii again.